Year-round at the Gulf of Georgia Cannery you can enjoy guided tours, or explore at your leisure with a self-guided exhibit map. From Victoria Day (mid-to-late May) to Labour Day (early September) you can enjoy the Cannery Experience, which includes guided tours of the permanent exhibits, sponsored salmon tastings, costumed heritage storytellers, and scheduled canning line machine demonstrations. Britannia Shipyards is an authentic representation of a once thriving community of canneries, boat yards, residences and stores. You can walk the historic boardwalk and learn about the history of the site through interpretive storyboard signage or take a complimentary tour of the Shipyards. Want to learn more about the Richmond Olympic Oval? Book a guided tour or just drop by to explore on a self-guided tour to see the Oval&apos;s amazing architecture and public art. You can also download the multi-language ROX Tour App Audio Guide (available for Apple and Android devices) for an in-depth synopsis and commentary on all Richmond Olympic Experience exhibits. 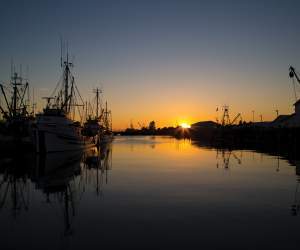 The neighbourhood of Steveston plays the part of Storybooke in the hit TV show Once Upon a Time. Stop by the Visitor Centre to purchase a Once Upon a Time walking map ($2.50) and walk in the footsteps of the show’s big stars! The map highlights the buildings featured on the show, along with their Storybrooke alter-egos. Take your mouth on vacation and head out on a self-guided tour of some of Richmond&apos;s best dumpling hot spots! Discover information on the types of dumplings you can try, check out a couple of sample itineraries, and watch the Dumpling Trail video for inspiration. Richmond is a foodie hotspot! From meeting local makers to sampling artisan beers, our city offers a full menu of delicious ways to experience a taste of Richmond and dive into one of Canada’s most diverse culinary scenes. Doors Open is an annual June event in Richmond. Residents and visitors are invited to explore the city’s arts, culture and heritage at about 50 partner sites. Artists, cultural and historic facilities, museums, aboriginal organizations, religious institutions, parks and other public and private Richmond organizations open their doors to the public and provide free specialty programs and behind the scenes tours. If you are looking for organized tours, you can learn more here.